Who needs hills to sledge down when a parent can pull you? 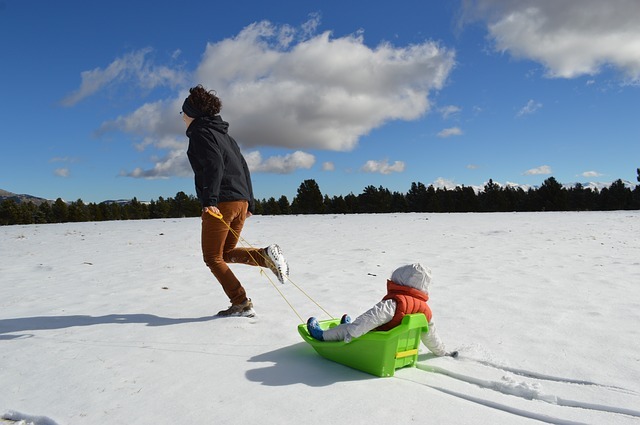 There is a lot for kids to enjoy in the outdoors in winter. In the days when I had small kids, getting them outdoors in winter was not a challenge. Today, I see a lot of kids opting to stay indoors sitting in front of their computers. These kids will only be kids for a few years so you should make the most of every opportunity to spend time with them having fun with outdoor activities for kids and families in winter. Bundle up the kids and make sure they are kept warm. Gloves, warm socks, coats and winter footwear should be worn to keep you and your kids comfortably warm. It is always good to have another pair of gloves dry and ready on the radiator to swap out with the wet snowy ones. With that done, you are all ready to have some fun in the outdoors! 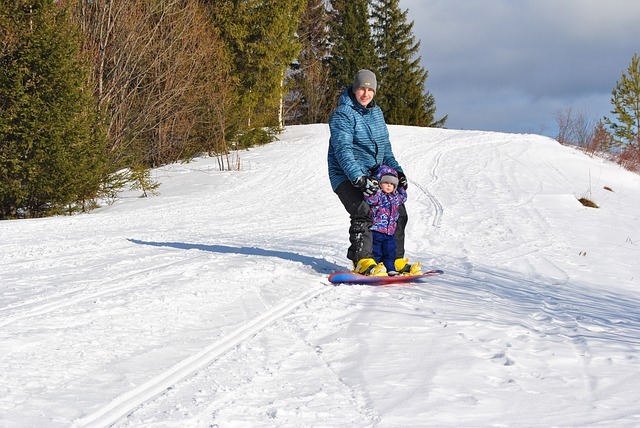 Outdoor activities for kids and families in winter is not only going to be fun, it is good exercise too. 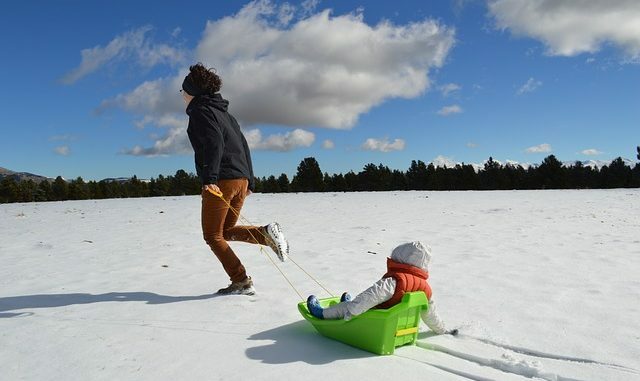 Here are some outdoor activities the kids and the entire family can enjoy and learn from in winter. Head to a major retailer and get the kids their sleds. Going down the hill in a sled is so much fun. Climbing to a hill to have a fun ride down can be tiring. It is good exercise though for the kids and yourself. Find out which are the best sleds this year. Kids always love to play the classic game of tag. This time it is going to be the flashlight tag. Instead of using hands to tag each other, players will use the beams of light. Bring the kids out in the garden at night and have them chase each other while flashing their flashlights. Be sure to be with your kids when they play this game. They might get carried away and wonder out in the streets trying to catch each other. Or you could get them their own laser tag gear. An old-time favourite! Even your grandparents use to roll snow into balls to build three parts of a snowman. 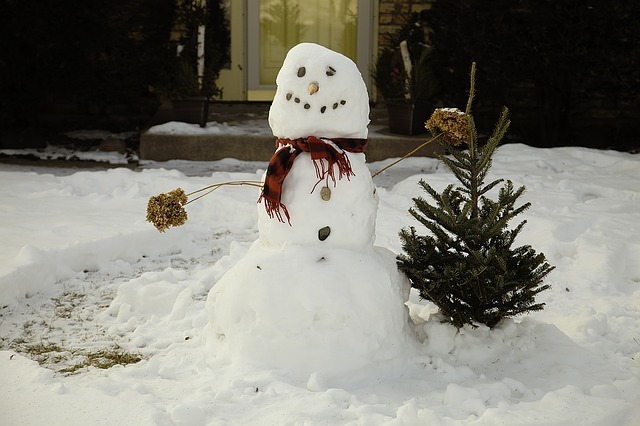 Making a snowman is not only fun, it is a good form of exercise, too. Moving and rolling all that snow takes a lot of work and will flex all of the kids’ muscles and yours too. Bundle up and dress in layers. Wear gloves, a well-fitting hat and comfortable winter shoes. Pack in some drinks and snacks. Since you will be hiking with kids, you should be travelling through well-marked trails. You also need to be familiar with the trail. You do not want to get lost in the cold and with kids in tow. Fat biking is similar to mountain biking except that they have wider tires for good snow traction. Fine a nice simple trail for the kids to try out. You can move on to some other trails as soon as the kids get the real feel of fat biking. The nice thing about fat biking is it does not hurt a bit when you fall in the snow. Snow removal is hard work. It is also a great exercise. 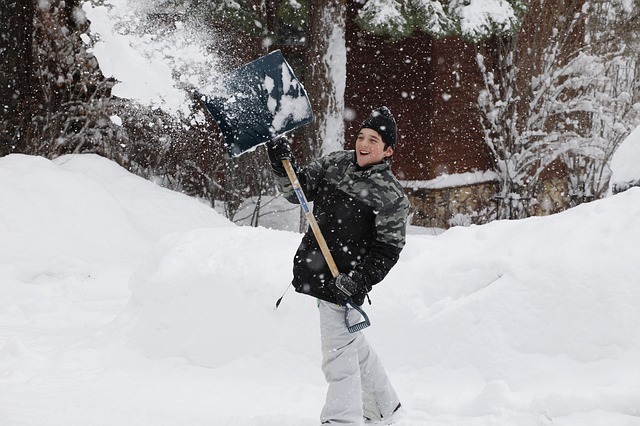 The kids can each pick up a snow shovel appropriate for their size and have so much fun clearing the pathway of snow. They will also have a sense of fulfillment that they were able to help in an adult chore. Treasure hunting will keep the kids on their toes. It will make them do a lot of thinking too. Hide in your garden or nearby park some Ziploc plastic bags with clues that will take the kids to next stop. Fill the “treasure box” with goodies such as glow in the dark sticks and stickers and a few candy bars. You may also include a photo of your next winter adventure to get them all excited! Freeze ice in jello containers, ice cube trays and other containers. On a chilly day bring those ice blocks in the porch and have the kids make some ice sculptures. Dribbling water will make the blocks of ice stick together to form fun shapes. If there is a mountain nearby, bring the kids out there for some skiing and snowboarding. You can rent out some gear and have the kids try a few skiing and snowboarding lesson. You might need one yourself, too. The kids will surely enjoy this activity and may just be requesting to be back soon. Invite some of your kids’ friends over and form two teams at least three in each team. Fill spray a bottle with a mixture of water and food coloring to make a large rectangle mark with a centerline on the ground. The teams start off at the opposite ends of the field. A player kicks off the ball and once a teammate catches it, he will try to bring the ball across to their goal by passing it to his other teammates. The players from the opposite team will try to tag the player with the ball to give them ball possession. The game ends when the players start getting cold. Ice skating is always fun for little and big kids. 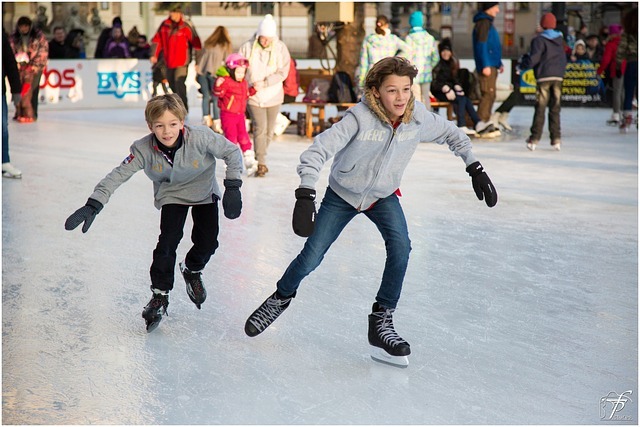 Indoor ice skating can be a lot of fun but ice skating in the lake, river, canal or pond can be even more fun! Rent or buy some skates for the kids and yourself. Look for a frozen body of water and glide around in fun. Find some of bubble mix in the kids’ playroom. Bring the kids outdoors and have them blow bubbles in the winter air. If it is cold enough they might just be blowing ice crystals. The bubbles will freeze before popping and will form into ice crystal. The kids will surely find these extremely amazing. A scavenger hunt will be a lot of fun for the kids. Hide some objects in the snow. Ask the kids to go out and fins frozen puddles, icicles, animal tracks and the objects you hid in the snow. Prepare some goodies for the lucky scavengers. Prepare a fire ring if you do not have access to one, check put camp sites or parks near your home. Chocolates, graham crackers, roasted marshmallow and the sound of a roaring fire will get all the kids excited. S’mores are perfect for cold winters days. Bring along a small amount of clay in plastic bags as you and the kids head out for the woods or well anything similar to the woods. During the walk have the kids pick up leaves, twigs, cones and other natural features. Let them study the tress searching for natural features that could be part of a gargoyle’ face. With the use of the clay, let them stick on the trunk of the tree the items they collected along the way. They can also use the clay for the other features such as eyebrows, mouth, eyes etc…. Take a photo of the kids with their gargoyle! There are a lot of things to do in the outdoors in winter. It can be such a waste of fun time to stay indoors. Which activity on the list did you find to be the most exciting for you, the kids and the entire family? When my kids were little, most of our winter days were full doing most of those activities. Whichever of the activities listed above you choose to do, it would be nice if you could do it as a family. If you want more ideas for fun outdoor activities for kids and families in winter, look at my winter activities section.